Or veggie picks, sandwich picks or cupcake picks, whichever you'd like! We had Faith's birthday party yesterday (and yes, her birthday was actually at the end of September, but I haven't had a free weekend till now). We had gotten the stuff to do a Perler Bead Houseparty so decided to combine that with her birthday. In the process of decorating, I had to make cupcake picks to match the beads and realized, these have bento potential! They are so simple to make--regular toothpicks along with a few of the beads. We opted for flower shapes, but I'm pretty sure you could design anything small you'd like to iron into place! We laid out the design first, then added a toothpick into it, before we ironed. 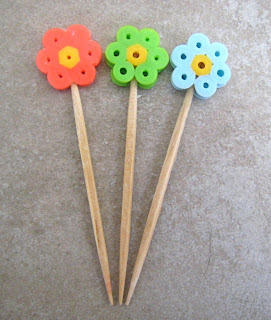 I ironed both sides and while the design was still hot, I pushed the toothpick deeper into the flower center (the hot beads were malleable enough to force it through multiple beads). 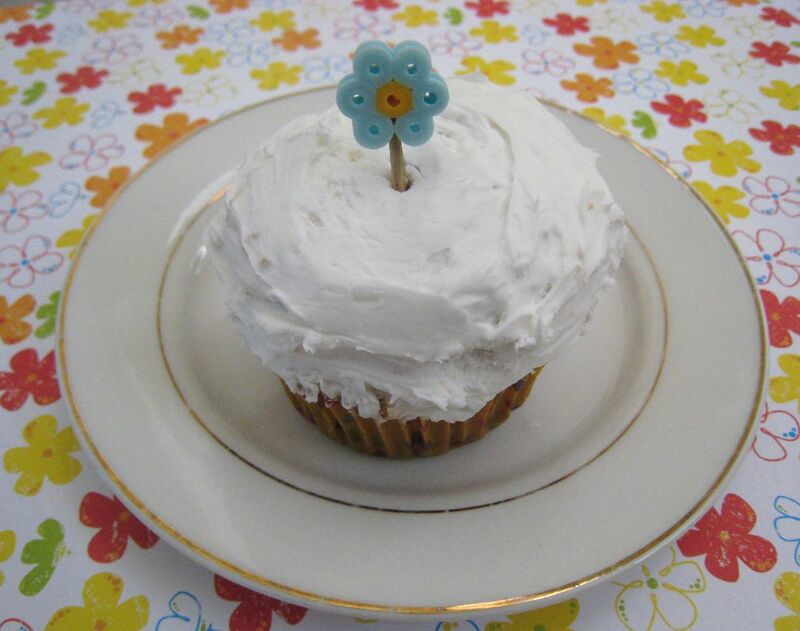 I let them cool and added them to cupcakes for the kids. We had 8 little girls, all 8 years old and up, so accidentally eating beads is not a concern of mine anymore. Wouldn't these be so cute in a bento? I need to try it this week. I know a lot of people ask about where to get some of the cute picks other than online. This might be a fun idea to try. 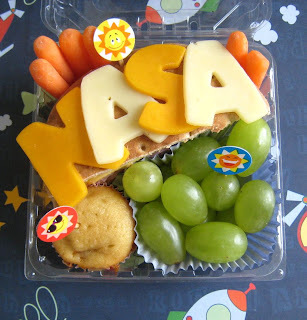 We also made our own with Faith's Nasa bento, these picks are toothpicks, cardstock & stickers. Kind of cute and easily disposable. Couple of great chances to win over on my review blog right now! Check out my suggestions for your sick kid, sponsored by Similisan, and leave a comment for a chance to win a $100 Visa gift card. Find out why we go home for the holidays, sponsored by Folgers, and how you can win a trip home too! such a great idea!!!! 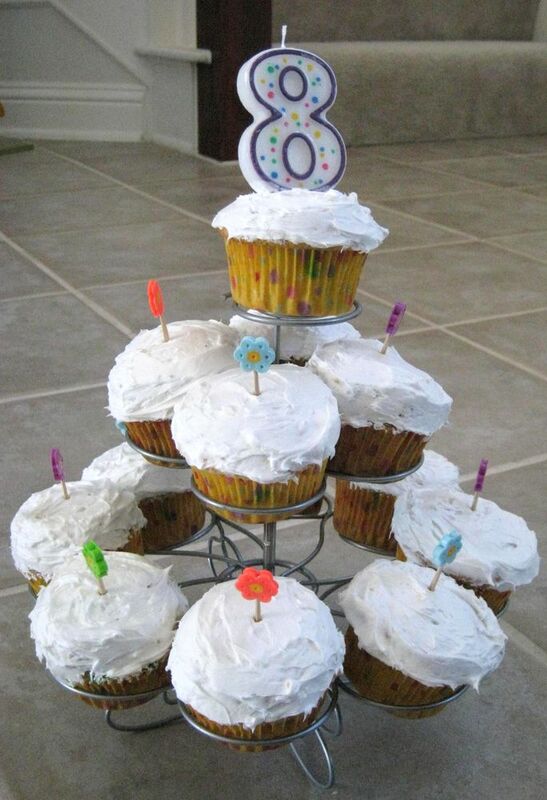 You can make them whatever shape you wanted! Love it! I LOVE this! Perler beads is one thing that will keep my kids busy for hours. These are perfect because they are much more quick and easy than the big ones. Can't wait to try it out! This is a *great* idea! Not just as the finished product, but also as the craft/process. Plus, I love that it gives a way to make picks with images/themes that I can't find in stores :-) How did you keep the outside petals in? So clever! 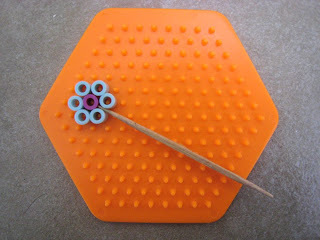 Do you think the picks would be reusable as wood or would plastic picks be better, perhaps? You are brilliant! My daughter used to love playing with those beads but hasn't played with them in awhile. I am totally going to "borrow" her supplies and give this a try!! I'd love to try plastic picks, I didn't have any. Faith and her friends were able to work the flowers off the wooden picks, so I think the decoration could be reusable. Again, this works if you have a kid old enough not to try eating the beads!